The issue of phrasing is a difficult matter as it is mostly personal and unique to every musician. What makes the difference between what we call a “well phrased” performance versus the opposite? It is difficult to put one’s finger on specific issues, but when the phrasing is right we all notice it and appreciate it greatly, whether we are trained musicians or not. If you wish to explore and deepen this aspect of your playing, here are some tips I can offer on how to listen and perform more carefully, so that there is more “meaning” and direction in your playing. Phrasing is made up of different elements, such as flow, taste, silence, intelligence, tenderness, dynamic contrast, flexibility and gestures, just to mention a few. 1. Curiosity is the spark and essential element in one’s musical development. Stay curious throughout your career and your playing will have a fresh and innovative sparkle as you mature as a player. Remember maturing never ends. As a young player listen to recordings and even better live concerts of performers of your instrument. Develop a taste for what sound you like or don’t. However, don’t stop there, expand to other instruments. We tend to hear music differently, when listening to instruments that are not our own. When hearing a different instrument than yours perform, listen intelligently. Compare what happens sound-wise, dynamically, projection- wise and color-wise, with the instrument you are hearing versus if it were your own. How would you play it? If listening to a larger work such as orchestral repertoire, or a choir, get the music, the score, and play sections of it. Other than being fun, this kind of study opens your eyes and ears to new possibilities and makes you aware to why a singer will hang on to certain notes, why a string player will need more time on a certain passage, why a pianist is so rhythmically free yet so accurate, why an oboist projects so well in most situations. This curiosity will make you change your way of approaching your repertoire and the way you play the nuances on your instrument. It will happen consciously and subconsciously. The subconscious part comes first, because as humans we react to things, sensations and emotions. Developing this reaction into a thoughtful sense-of-taste is the conscious process, where we use our musical intellect and intelligence. This curiosity will shape you as a human and as a musician, which will give a tone and pace to your playing. The same happens when one speaks in different ways, dependingon whom we are talking to and what we are talking about. The speed of our sentence, the intensity of it, the places we pause between words, the emphasis we give to certain places of the sentence, are what we call phrasing. 2. As in most things, the more open minded we are the better we do in our own living and being. Explore and listen to other genres of music, such as jazz, folk, bluegrass, pop or whatever it is that may interest you. Listen with classical ears and get to know why different kinds of music are different. Try to listen to what it is that makes a certain genre unique. Find similarities. You will find that jazz players deal with the same kind of phrasing issues we do, they make tasteful decisions and sometimes not so tasteful ones. The same applies to pop singers. Who really speaks to you? Who touches your heart? Search for answers as you are opening your mind to a broader palette of possibilities in your own playing. Personally I learned so much from listening to Latin jazz and understanding the different rhythms. I studied the “clave” culture, and how a clave fits our western music meter. I learned, and continue to do so, how Salsa and Mambo unfold, and what elements make them distinct. Suddenly playing difficult rhythms in my own classical world was much easier, because my mind was open to a new way of thinking. The clave is basically a beat that one dances to, different from the traditional meter that is present in the melody and harmonic structure of a piece. The different influences and the different characteristics of music help one make intelligent decisions when it comes to where to breathe and not disrupt the music, rhythmically and harmonically. Always study the rhythmic patterns and know how your harmonic structure unfolds, before you make your final phrasing decisions. Sometimes, what you wish to do instinctively does not make sense, once you hear the harmony accompanying your part. To acquire this kind of knowledge and to have this deep understanding of the music one is playing one should expand ones horizons to as many different types of music as possible. You may like some, you may think others are not so interesting, but they all add to the development of your musical taste and finesse. 3. Time to leave the conceptual and get down to concrete matters. I recommend the study of the music of Haydn, Mozart and Bach, more than anything for developing a fine and intellectual sense of phrasing. Listen to Mozart violin sonatas, piano sonatas, concertos and above all his operas. The structure and pure beauty in Mozart operas is pure genius. Listen to Cosi fan tutte, Don Giovanni or Marriage of Figaro, and realize how carefully each duet, each instrumental exchange are set up. Follow the words in the score as you are listening, and see how the music matches them perfectly. Eventually you will notice that all of Mozart’s music is influenced by his operatic writing. His flute concerto, the Clarinet quintet, his piano concertos and his violin sonatas, are all “mini” operas with different roles present. In the Bach opus, pretty much anything will be of guidance and revealing the infinite possibilities in how to phrase a certain passage. I still find new elements in the Partita in A minor for solo flute that make me rethink how I phrase the piece. I use Robert Stallman’s volumes of Bach studies, collections of Bach works for cello, keyboard and violin, all transcribed for the flute, for study purpose. These are not necessarily meant to be performed but simply including the reading of one Bach work every day, furthers your knowledge and taste progressively. I see it sort of like taking vitamins daily, one doesn’t notice the difference, but they are good for your immune system in the long run. Study Haydn String Quartets, piano works and sonatas for violin. Haydn’s music is so clear and obvious in a certain sense, that it is ideal for experimenting. The rules are clear and beautifully traditional, so that a wrong breath or an unwanted stress on any part of the measure is of great disturbance even to the untrained ear. In time, as you get accustomed to the style of this period (late 1600s to late 1700s) you will find yourself breathing with the music in a way that makes sense. If the breaths fall in correct places, the stress of your musical sentence will also be correct and the meaning of what you are trying to say will be deep and personal. 4. Lastly, you should apply all the sensations and ideas to your own playing. The only way to do this is to take risks and not be afraid to make mistakes. Imitating a certain performance, or breathing a certain way that you heard previously on a recording or live performance can be a good start. However, trying your own ideas out is of greater importance. Risk having a colleague or teacher tell you it “is wrong”, but try to sell your thought and ideas. Begin with obvious gestures that are idiomatic on your instrument. On flute, the sound naturally gets louder as you get into the high register and softer in the lower one. Staccato passages have a certain flare, different from a legato passage. Play into these differences, following the natural tendencies of your instrument. Then, venture into dynamic range, experimenting with more difficult nuances to execute. Remember there is always a way, as long as you have a clear idea of where you wish the music to go. Breathe in several spots, until you decide on the ideal location for a breath. This also might take making a few errors in the beginning of your study. Be patient, open minded and adventurous as the journey will lead you to new and interesting concepts. Practice as if you were practicing a speech in front of a mirror, trying to give the right inflection and tone to your sentence, as well as the facial expressions you would associate with certain ideas. Music works the same way, you have to plan and practice every single detail, to make your interpretation unique to you, which is ultimately what sets us apart from other musicians. Our performing style is defined by each gesture and by the little things just like our personality. • Think of your breaths as part of the musical line. • Always practice taking the breath as if you were practicing a difficult passage; one must practice taking breaths in the spots we place them, especially the quick ones. • Go for longer phrases in general. Long phrases let the music flow more naturally. • Remember that sometimes there can be silence without a breath. • Remember that sometimes there can be sound still ringing through a breath. • There is always more than one phrasing option. • Your choices will change in time, whether over a day or a few years. • Observe all markings in music as they always indicate what should happen. It is your job to search deeper and make your interpretation unique. • Play through all music very slowly, even when you have learned it. Every time you will find a new element, a new nuance that grabs your attention and makes you realize something new. It has been quite a while since I have updated my news page. To say the least, the last 6 months have been most interesting, productive and innovative! As mentioned in my previous blog, in November of 2012 I had the pleasure for the second time, to teach a master class at the Shepherd School of Music at Rice University, for the studio of the great Leone Buyse. It was so inspiring and wonderful to hear some of the most talented students in America. This was the “prelude” to a wonderful duo recital with Ms. Buyse, in late January, when we played a whole program of works for two flutes and piano, ranging from Monteverdi to Doppler, with Mendelssohn and Ciardi in there as well as a great trasnscription of Mozarts two piano sonata in D major. Robert Moeling was such a wonderful pianist and friend to agree to do this. We were so lucky he joined us for this venture. Needless to say, the honor it was for me to be on stage with Leone Buyse, cannot be recounted in words. I learned so much from this experience, as intonation, phrasing and just pure friendship coming through the music was what this concert was all about. The months after this I spent visiting Seattle, for a wonderful series of recitals with old friend, pianist Jensina Oliver, and visiting Seattle for the first time was a rare treat. We played Mozart sonatas, Brazilian music and tangos. This was followed by an incredible guest artist visit to MTSU, in Tennessee, where I taught a master class for Deanna Little’s studio. The level and warmth of her studio are fantastic, and I just didn’t want to leave. I could have kept teaching for days! For the recital there I was so lucky to be joined by pianist and friend Lillian Pearson, who now lives in Nashville, and was able to come down for this event. April took me to the International flute festival of Costa Rica, which as usual was too much fun. Reuniting with friends, old and new, such as Michel Bellavance, Rogerio Wolf, Carla Rees, Christine Beard, Jean Louis Beaumadier, Jean Michel Tanguy, Eldred Spell, Horacio Massone, Matjaz Debeljak, Tim Carey and Joel Tse, made me want to stop time again, and never leave. June was Ecuador month, for the Flute Festival in the Middel of the World, held in Quito. Friends and oragnizers, Luciano Carrera, Luis Fernando Carrera, Gustavo Lovato, Nestor Labre and Rocio Lima, were fabulous in putting an unforgettable festival together. The Colombian contingent of flutists, who came down, after thirty hours by bus, to participate in the festival was a particular highlight for me. Now, the last week of June, I look forward to teaching for Floot Fire, in Houston, together with fabulous colleagues and friends, such as Jennifer Keeney, Lilia Agard, Seth Morris and many, many others. Immediately after I head to Europe for all of July, where I first will teach and perform at a new festival in Southern France, the Zodiac Festival, then on to two weeks of being home, in my Tuscany, where I will have the immense pleasure and excitement to direct, teach and perform at Flauti al Castello, my new international flute master class in duo again with the wonderful Leone Buyse and pianist extraordinaire, William Braun. This promises to be a magical week of fluting, food, wine and friendship in the heart of Tuscany. Once back it will be NFA time, where I look forward to performing Jeffrey Harrington’s solo flute work, En un Clin d’Oeil. This has gotten long, so I wish you all and incredible summer. Check back here in the fall as I am sure I will have many more stories to tell! January 2013, has been very busy and fulfilling already! The Christmas break was used to rest a bit and to practice for the January concerts I just finished. It was the biggest joy and honor to walk on stage to make music with dear friend Leone Buyse at Rice University as part of their Faculty Series. We were joined by pianist Robert Moeling and the three of us just had a ball with the fun program we put together. We performed works ranging from Monteverdi to Ian Clarke. After appearing on a fun “chat” on the radio, on St.John Flynn’s radio show “The Front Row”, we had a fantastic turn out on the night of the concert. Maybe it was the subtlety of the Duo Seraphim from Monteverdi’s Vespers 1610 which was second on the program, or the finale of Bellini’s “La Sonnambula”, that earned us a most delightful standing ovation. This concert will stay in my memory for many years to come! The very next day I traveled up to Seattle, to play two runs of the same recital with pianist Jensina Oliver, and old friend from my University of Utah years! Such a joy to play with her again in this beautiful city, I had never been to! The first recital was held at a private home, and our hosts provided us with a fantastic Bösendofer piano! What a treat. The second was in a lovely hall at Shoreline Community College. The music we chose was so perfect for the occasion: Mozart e minor sonata K 304 ( originally for violin ), Schumann’s Three Romances op. 94, Piazzolla, Latin folk and Breno Blauth’s Sonata T.5. I sure hope to visit this amazing city again, to perform and see new friends! I just got back from a most wonderful trip to Natchidoches, Louisiana, where I was a guest of Dr. McDermott, teaching her wonderful students and giving a solo flute recital. The drive from Houston was beautiful, especially heading East over the border from Texas to Louisiana. Out of nowhere one arrives in this beautiful university town of Natchidoches. I was hosted my a supporter of the arts, opening his amazing house right on the river. I felt like i was at a southern grand hotel! One does not often get asked to play a completely solo flute recital, so the project was very exciting to put together. I started with a transcription by Robert Stallman of Bach’s Allemanda from his solo keyboard partita in D major BWV 828, followed by the entire Marais’ Les Folies d’Espagne. I adore this piece and it was a delight to play it in this vibrant hall! Next, I gave the American premiere of “En un clin d’Oeil” for solo flute by wonderful American composer Jeffrey Harrington! It was very well received and many students asked me where to find Jeff’s music! I have always loved the 30 Caprices op. 107 by Karg-Elert, so to follow Jeff’s piece I made up a little suite of my favorite seven caprices. I picked some difficult ones and it was fun to perform this combination of them in concert for the first time. I will definitely repeat this. To end the hour long concert with no intermission, a wonderful formula in my opinion, I played another small suite of four South American solo flute pieces: Solo del Pajarillo by Omar Acosta (Venezuela), Contradanza by Paquito D’Rivera (Cuba), Bom Senso by Pixinguinha (Brasil) and El Grillo, a Colombian folk tune. The next day, I had the pleasure of teaching four of Dr. McDermott’s wonderful students. It is always so refreshing to hear new students, listen to their perspectives, opinions and interpretations. I want to thank the entire clarinet studio as well, at NSU, for attending my concert and class in mass!!! It is a true pleasure to see such excitement form so many instrumentalists! I hope to return in the future! It is now almost a month after I returned from a wonderful trip to Las Vegas, where I was a performer at the 2012 NFA flute convention. I played a wonderful Brazilian sonata from 1959 by Brenno Blauth; I highly recommend this piece as it is flashy, beautiful and so much fun to play. It is a definite crowd pleaser and relatively unknown in America and Europe. It was a pleasure sharing the recital with amazing flutist and friend Michel Bellavance and wonderful flutist Alice Dade. I was touched to see dear friends and colleagues in the audience and thank everyone who was there. Not to mention reconnecting and playing in duo, after so many years, with pianist Jensina Oliver. The convention was great in many other ways as well, with great programming by chair Zart Dombourian-Eby! I heard a wonderful performance by Jennifer Grim of an beautiful work by Las Vegas composer Virko Baley. It was just stunningly played, and keep in mind hat Jennifer was working full duty at NFA as well! At the gala night it was amazing to hear Amy Porter performing the incredible new Concerto for flute and orchestra “Trail of Tears” by Michael Daugherty! What a piece! 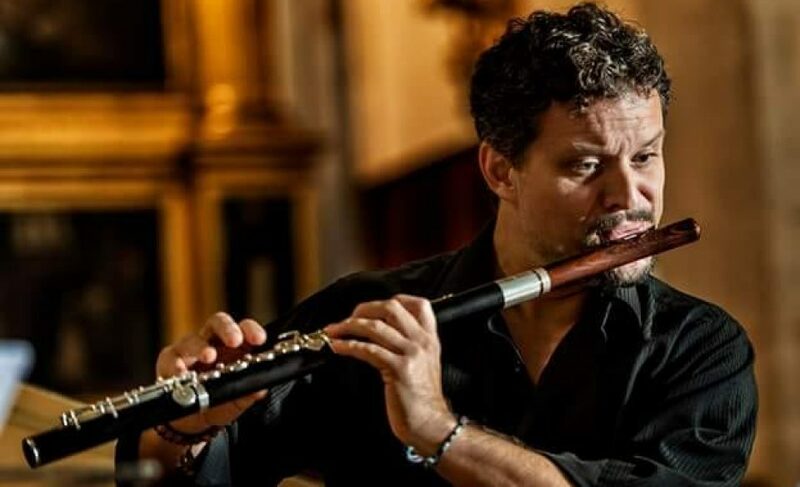 This was followed by two gems by Mozart, the Andante and the Rondo, the first played by legend of flute Peter-Lukas Graf, the second by one of the most elegant players I know and dear friend Aldo Baerten. It was such a pleasure to meet and make friends with Peter Verhoyen. Watching him teach and perform was inspiring and heartwarming. What a warm soul and what a piccolo player. One of the best I have ever encountered. It was great seeing and hearing old friends, like Rogerio Wolf (wonderful rendition for flute of Dvorak’s 4 Romantic Pieces for violin and piano), Nicole Esposito and Eva Amsler. It was also wonderful to meet so many new friends and inspiring flutists from all over the globe. Horacio Parravicini, became a good new Italian brother and I hope to see him many times in the years to come. Magda Schwerzmann palyed traverso so beautifully I could hardly stand it and it was so great to get to know her personally for the duration of the convention. I would like to thank my dear friends of my beloved Muramatsu Flutes! Thank you for your constant friendship and support and for taking care of my flute in the most special way! It was also amazing to reconnect with my dear friends of Miyazawa flutes and Haynes flutes. You truly care about flutists, and the instruments you make reflect it. Thank you to my dear friend Tobias Mancke, the maker of the worlds greatest head joints. Don’t get me wrong, there are many amazing head joints out there, but Toby’s head joints just do it for me! I do blame him for keeping me out too late enjoying good wine. Or should I thank him? Thank you to my amazing friend and owner of Flute Center of New York, Phil Unger, who always provides good flutes, good times and has helped millions of flutists world-wide find their instruments! It was a great and inspiring flute convention and I look forward to the next in New Orleans. Lately, many students of mine, colleagues and friends have been looking at changing their instruments. I have to say this is a situation I have been in several times and currently am also thinking of making one more and final change to which my instrument is going to be. So I decided to write down a few thoughts about the process. The search for a new instrument, is fun, educational, stressful and tiring, but extremely important and rewarding in the end. It makes you stronger emotionally, opens your ears, your heart and shows you places of your professional world you may not have thought of before. I will speak about flutes, since I am a flutist, but the ideas are valid for all instruments. There are many flute makers out there, and frankly they are all great. We are all very quick at declaring which makers are the best, or not. Which makers make flutes in tune, which have more color possibilities, which play louder, which are better for orchestra, and the list could go on. The truth for me is that all these factors, which we instinctively attribute almost completely to the instrument in itself, are actually within us as players and musicians. It is not a new statement to say that intonation comes from within, and not from the instrument. Of course, a well built flute, makes a difference, and there certainly are situations when the instrument has major scale issues, making it more difficult to play consistently in tune. However, if we really open our ears and trust them fully, playing any instrument in tune becomes an easier task all together. Same goes with projection, dynamic palette, thickness of sound, transparency, timbre, or any other nuance we look for in a good instrument. Relying on our ears, and the ears of trusted colleagues is most crucial. Our qualities as players must be enhanced and showcased by the instruments we chose. If we are comfortable on our instrument, those qualities will all come out and we will declare that this is the “best” flute maker there is. This of course is true, but we can’t forget that it is what we feel along with others that reach the same level of comfort on that make of instrument. I do think it is important to have a so to say favorite, because being excited about things is crucial, in everything we do, especially in our art, music. We are performers, and our instruments never stop evolving, just as we do as people and active performers. We must try to never forget this. After all the philosophical mind work, after trying different materials, after listening to different opinions on what you should or should not play, just go out and play. Play the way you play, adjust, let go, risk, and your decision on what makes you comfortable will come to you in a very serene way. Play in the privacy of your home, play in chamber music settings, in orchestra, in big halls and in dead halls. Play for musicians as well as for non-musicians. You will be surprised how insightful a non-musician’s ear can be! I like to compare experiencing a great instrument to the feeling of finally sleeping in your own bed, after a long period of travel. That feeling, of being home, is when you will have found the best instrument out there!